Some wines are ready to drink as soon as they are made. Others improve immeasurably over time. This spring cycle racing has proven to have much in common with wine. The selection of great races range from newcomers like the Tour of Qatar and the Tour Down Under to the beautifully aged, century old, ‘ Five Monuments '. Earth enriched with manure promotes healthy vines. With cycling the manure has been increasing in quantity over the past few seasons from the increasingly vindictive fights embroiling the UCI with the ASO and WADA. Last season it reached such a crescendo that everyone was pleading for it to end before they brought about the destruction of the sport. A relatively quiet winter led us to believe that the fights had moved into the back room and out of sight. Perhaps we could at last focus on the racing. This proved to be an empty hope as the antagonists lashed out with renewed fervour. It seemed that once again the sport was on the brink when the UCI threatened any Pro Tour riders and teams with fines and sanctions should they participate in the Paris-Nice stage race (organised by the ASO) in March. The teams ignored the threats and the Paris-Nice continued as planned. So far the UCI has not followed through with its threats. The central issues revolve around power, money and egos. It seems that the sport itself, which includes the riders, the fans and most importantly the sponsors are being totally ignored. It's no wonder that the so called leaders of our sport garner virtually no respect. The riders and teams are mere pawns in the power struggles. But they are very powerful pawns who have responded in the most appropriate way that they can. Attack is the best form of defence and the peloton has treated us to a spring campaign of tremendous attacking racing. In fact as the ‘spring classics season' draws to a close the politics of cycling has all but disappeared from view. The riders and teams are not politicians. They are professional athletes and these past few months they have focussed on what they do best - race. It is not an understatement to say that we have been treated to spectacular racing. Attack, attack, attack has been the formula. In response huge road-side crowds have been gracing the courses of the great classics and semi-classics. Hopefully the cycling politicians are taking note and will in turn respond with professional and dignified actions. Meanwhile if the racing continues through 2008 as it begun, we are going to witness a tremendous season of Grand Tours, classics, World Championships and of course the Olympics in Beijing. While the sun may be good for the soul and building great racing form, it is the great races of Europe that ultimately pay the bills and turn the best of the best into great champions. Since 1945 the Omloop Het Volk (1st March) has traditionally been the first great race of the European season. Run over the gnarly cobbled roads of Belgium , and often accompanied by raw Flemish weather, this race is a brutal return to reality. This year the race was run under sunny skies and at hellish speeds. Normally this first serious test of the year departs from Ghent at relatively sedate speeds as the riders gingerly reacquaint themselves with the Northern roads. It was almost as if the peloton was trying to distance itself from the UCI/ASO/WADA squabbles as they stormed out of town at breakneck speed. A break soon established but as the race progressed it was clear that nobody was giving this race away. Already the big guns' were coming out to play; Fabian Cancellara, Stijn Devolder, Thor Hushovd, Lief Hoste and even World Champion Paolo Bettini. Under the impetus of these and many other riders the early break was doomed. With 50kms to go Phillipe Gilbert attacked hard on the cobbled Eikenberg climb and that was the last anyone saw of him until the finish where he came in 58 seconds ahead of Nick Nuyens and over a minute ahead of third placed Thor Hushovd. Little did we know it, but this hard fought race had set the die for the rest of the ‘Spring Campaign'. While the racers were racing and the public were flocking to the road sides in ever increasing numbers, the UCI and ASO had sunk into an ugly stand off hurling threats and counter threats at each other. The Paris-Nice (9th - 16th March) was the first of the ASO's big races for the year and, as with all of their races, they were refusing to comply to the UCI's demands which took away some important aspects of their ability to decide how the race would proceed. The ASO would not give in and the UCI threatened sanctions and fines to the organiser as well as any riders and teams taking part. During the days leading up to the race the atmosphere was like that before the famous gun fight at the OK corral. One of the big sticking points was that the ASO refused to agree that every Pro Tour team gets automatic entry. Astana was not invited due to the team's ugly performance (Vinokourov, et al) at last years Tour. Even though Astana 2008 is not the same team as last year they not only lost the chance to ride the Paris-Nice but also every other ASO run event (including Paris-Roubaix and the Tour). Now with Astana, Alberto Contador has thus been denied his chance to defend both his 2007 Paris-Nice and Tour de France victories. Race day arrived and everybody turned up in Paris apparently not giving a hoot for the UCI's threats. Would the UCI fine and sanction all 160 starters and their team management? Nothing was heard and still, as we head into May, there have been no repercussions. Like the Het Volk, the race itself was run under largely fine weather and the riders made us quickly forget the ASO/UCI fight. Aggressive racing maintained high daily interest and the public turned out in force. In Nice David Rebellin finally made it to the top of the GC podium after twice being second (2004 and 2007) and once being third (2003). With such experience he was more than qualified to sum up the race: “this was one of the most beautiful Paris-Nice ever held, with a lot of battles and suspense. It was a very hard and very nice race. It was a highly contested race till the end." Unlike the weather, March has no lambs. The lions rule. Just as the battle in France (Paris-Nice) is reaching the Mediterranean the fans are turning their attention to Italy and the Tirreno-Adriatico (12th - 18th March). This race was more suited to the sprinters and power riders. Petacchi, Friere and eventual GC winner Fabian Cancellara starred is this fast and furious race. By now the peloton was truly in its stride with almost two months of hard one-day races and early season stage races in their legs. But now they were heading into the really big stuff as March 22nd hosted the first of this year's ‘Five Monuments', the Milan-San Remo. At 298kms, the ‘Primavera' ( Milan - San Remo , 22nd March) is the longest one-day race of the year. First run in 1907, this was the 99th edition of the race. The signature climbs of the Cipressa and Poggio represent the final hurdles before plummeting down into San Remo . Unfortunately road works forced the finish away from the legendary Via Roma and across town to the Lungomare Italo Calvino. For the first 200kms or so four riders headed the race and gained a 16 minute lead at one point. However the M-SR is one of the biggest prizes of the year and such an advantage soon melts like the spring snow. With about 90kms to go, and as the huge peloton started to ride alongside the spectacular Ligurian Coast , someone lit the blue touch paper and once more the fans were treated to no-holds-barred racing. With about 30kms to go World Champion Paolo Bettini attacked on the Cipressa and took several others with him. The peloton disintegrated in its efforts to contain the escapees. “Il Falco”, Paolo Savoldelli plunged down the descent and caught the four leaders. They worked like demons to hold off the chasers but were eventually swallowed up by about twenty riders which included Paris-Nice winner Rebellin and Tirreno-Adriatico winner Cancellara. On the Poggio attacks came from every direction and on the descent into San Remo Rebellin and Pozzato held a slim lead. As the road levelled out Landaluze pulled the remnants of the race back to the two leaders. Just as Landaluze finished his effort Cancellara took off. That was it, as he put in a brilliant time trial effort to win by 4 seconds ahead of Pozzato and Gilbert. This was truly a vintage race of epic proportions and here we were only half way through spring. In the world of fine wine ‘appellation contrôlée' defines wines of guaranteed origin and of a certain very high standard. April is crammed packed with quality races that meet these wine criterion. To use our wine analogy again, there are two ‘casks' of outstanding races that for most one-day race fans are the pick of the crop. The first group of races, known in the North of France and Belgium as the ‘Golden Week', comprise the Tour of Flanders (6th April), Ghent-Wevelgem (9th April) and the Paris-Roubaix (13th April). The second group of races focus on the Ardennes region and comprise the Amstel Gold (20th April), Flèche Wallonne (23rd April) and the Liège-Bastogne-Liège (27th April). ‘De Ronde': To the Belgians there is no question that the Ronde Van Vlaanderen is the single most important race of the year. The nation literally comes to a stop to watch it unfold. With its 17 “helligen” (steep cobbled climbs) this race is a brute. This year it was the only race to get weather that the fans pray for and the riders despise. Cold and blustery, periods of rain, snow and hailstones to make life in thin lycra very unpleasant. But the Belgian ‘flahute' seem impervious to such conditions and as soon as the peloton had moved away from the start in Brugge they put the hammer down. This ensured that the many escape attempts had a very short shelf life until the combination of speed, ‘helligen', the weather and distance saw the elite riders taking control. With 30 kms to go Ballan, Devolder, Langeveld, Hincapie and Kroon rode away on the Valkenberg. Behind them a group of 40 riders chased furiously and pulled in the lead group at the base of the Eikenmolen ascent. Just as they connected Stijn Devolder took off again. Behind him a game of brutal cut-and-thrust took place as they headed up the famed Muur Van Geraardsbergen and then the final climb of the Bosberg. Devolder resisted all attempts to reach him and got to the finish in Meerbeke 15 seconds ahead of Nick Nuyens and Juan Antonio Flecha. For a Belgian pro the closest thing to nirvana is to win the Ronde. To win it wearing the jersey of the Belgian national road race champion (as Devolder was) is nirvana! Ghent-Wevelgem: This race, first run in 1934, is considered a ‘semi-classic'. Run mid-week between Flanders and Paris-Roubaix, one would expect this to be a somewhat tamer race as the big riders prepare for their date with Roubaix . If that is the plan then someone forgot to send out the memo because as soon as the race left Ghent it was full gas as breaks spat off the front trying to get away from the crazed peloton. The most notorious obstacle in this race is the Kemmelberg. Mercifully the steep cobbled descent from this climb was eliminated this year for a much safer tarmaced road. Although the second ascent up the narrow cobbled Kemmelberg split the bunch it could not prevent one of the few bunch sprints of the spring campaign. Coming into Wevelgem at warp speed it took very strong nerves to hold a place at the front. Oscar ‘the cat' Friere relishes such conditions and the former World Champion captured one of his signature wins. Paris-Roubaix: Tom Boonen had ridden through a surprisingly quiet (for him) spring season. At crunch time at Flanders the previous week, Tom had lacked the decisive punch and ended up devoting his services to team mate Devolder. With wins in Milan-San Remo, Eroica and the Tirreno Adriatico, 2006 Paris-Roubaix winner Fabian Cancellara was seen as the big favorite. As it turned out his form was clearly on the downward slope while Boonen was just peaking. To many, P-R needs rain and wind to turn the small cobbled roads into a slimy quagmire. This year it did not rain although rain the previous night did make for some stretches of messy road. ‘The break of the day' established itself after about 10kms. This hardy trio lasted until about 70kms to go as the real contenders were setting about each other with hard attacks and even harder chases after falling or puncturing on the gnarly cobble stones. With 50kms remaining the main characters had been identified. Devolder, Boonen, Cancellara, O'Grady, Ballan, Van Summeren, Hoste and the young newcomer Martyn Maaskant were now in charge at the head of the race. Quick-Step played the old one-two and sent Devolder up the road. CSC responded in kind and sent O'Grady after Devolder. This pairing was simply too dangerous for the Silence-Lotto pair and Van Summeren was instructed to hunt them down for his team leader Hoste. With seven cobbled sectors to go Boonen turned on the afterburners and took Cancellara and Ballan with him. On the Carrefour de l'Arbre Cancellara tried to drop his two companions but his recent form was not quite there. The three then rattled over the final serious cobbled sectors of Gruson and Hem to enter the Roubaix Velodrome together. ‘Tommeke' was in no mood to be denied his second Roubaix and easily took the sprint ahead of Cancellara and Ballan. Possibly the most significant performance was by the 25 year-old Martyn Maaskant who is only in his second season as a pro. He came home fourth just ahead of Stuart O'Grady. Amstel Gold: With the cobbles behind them the peloton now moved into the Ardennes region. To many people racing in Holland means pan flat roads but the Limburg region is famous for its long and challenging climbs. Having noted the great racing thus far this year the spectators turned out for the Amstel Gold in incredible numbers to catch a glimpse of the world's elite riders battling it out. Here a new cast of characters were taking center stage. However they had to wait until the break of the day finally exhausted itself after 200 or so kms. As the doomed break hove into view the Dutch fans were elated to see their new hero, Robert Gesink, go on the offensive. He managed to create a new but small break which was immediately viewed as too dangerous. From then on attack and counter attack was the order of the day. 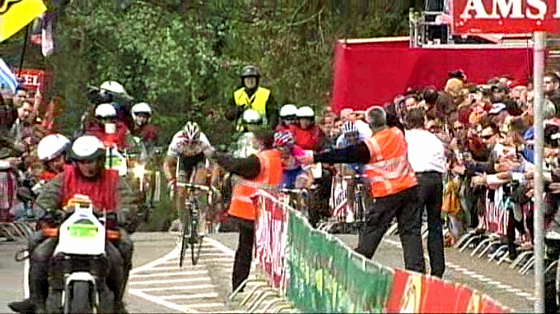 Eventually nine riders hit the famous Cauberg climb to the finish. At the top Damiano Cunego, Frank Schleck and Alejandro Valverde were left to duel it out. Catastrophe nearly struck when the three leaders almost disappeared up the team car slip road just before the finish line. Frantically waving officials just managed to keep them on course to contest a clean sprint which was won by Cunego from Schleck and Valverde. Flèche Wallonne: Like the Ghent-Wevelgem this mid-week semi-classic is wedged between two bigger races. But like every race this spring nobody was holding back. This race is most famous for its impossibly steep Mur de Huy climb (22% in places) which is climbed three times, the last of which is to the finish. Yet again the bunch set off at a furious pace which did not prevent a good break from establishing itself. In pleasant dry conditions the pattern seemed to be set, but then at around the halfway mark the heavens opened up in true April fashion. With the rain, the break started to fall apart while behind them the peloton smelt blood. The last remnants of the break were reeled in with 35kms to go. Attack after attack soon turned the race into small groups of bedraggled looking cyclists. On the final gut wrenching climb up the Mur de Huy Cadel Evans made a grab for victory but he was overhauled just before the line by CSC's Kim Kirchen who was churning over an unbelievable 53 x 21 gear. Liège-Bastogne-Liège: ‘La Doyenne', the old lady, is the oldest of all the classics (first race 1892) and is one of the Five Monuments. The weather in the Ardennes can be truly horrible. It was here that the WWII Battle of the Bulge took place. It was this race that immortalised Bernard Hinault when he endured a snow storm in 1980 to win by 9 minutes 24 seconds from Hennie Kuiper. This year no snow or rain, just beautiful warm spring weather. Regardless of the weather, this race is one of cycling's most prestigious prizes and any pro worth his salt wants this one on his palmarès. Five riders created the break of the day until the last of these, Pierre Rolland finally succumbed at the base of the Côte de Sprimont with 30kms to go. Getting to this point in the race had torn the race to shreds and after a lot of jousting four riders were left out front. Alejandro Valverde and David Rebellin (former L-B-L winners both) were riding with the CSC Schleck brothers Andy and Frank. The brothers Schleck set about their illustrious companions when, with about 10kms to go, Andy (the younger brother) attacked. Frank sat back and enjoyed watching Valverde and Rebellin turn themselves inside out chasing him down. Up the final climb of the Côte de Saint-Nicolas Rebellin hauled Andy back who promptly got dropped. However in a situation like this the last rider you want to be with is Valverde and the Spaniard duly claimed his second L-B-L by easily beating Rebellin and Schleck ‘the elder' in a long sprint. For years we have been entering each new season with great optimism for the future of the sport. But with sickening repetition each season has seen doping and political scandals destroy many of our hopes. Is it too naive to think that 2008 is emerging as a new era? The signs are there but we still have a long season ahead of us. Since the Paris-Nice showdown between the ASO and the UCI it has gone very quiet between the ‘suits'. Have they finally come to their senses and taken their fights behind closed doors? Time will tell. Thankfully the new season is thus far devoid of any new drug scandals. Are we to believe that the UCI/WADA drug screening programs are finally working? Also, bolstering these efforts are the programs of the teams themselves. CSC, High Road, Slipstream and others proudly promote their own internal (and very expensive drug screening programs). At least since the 1998 Festina affair the sport has talked of being ‘clean'. Unfortunately unscrupulous doctors and scientists have worked diligently to find ways to circumnavigate the drug testing protocols. It would seem that at least up until the Vinokourov/Astana affair at last years Tour, the cheats still felt in control. Seasoned fans cannot but help notice that this Springs racing has had a very different feel about it. The big winners have peaked for one or two events and then fallen away looking like normal mortals. The peloton has often looked like any race that most of us amateurs ride. Tired riders slogging along at the back of the pack before finally throwing in the towel for the day. The phenomena is perhaps harder to spot in the one day races but in a stage race the signs are unmistakable. On stage 4 the Paris-Nice headed for the legendary Mont Ventoux. Rabobanks 22 year-old prodigy Robert Gesink rode the entire race off of his back wheel except for the tenacious Cadel Evans who was rewarded for his painful ride with the stage win. We have become accustomed to watching stage race leaders be protected by their team and dictating affairs at the head of the race. With Gesink in Yellow following his Mont Ventoux ride, it would have been standard fair to see his mighty Rabobank team grasp the race in an iron grip. Instead, and in the manner of all races in this spring campaign, it was attack, attack, attack. The Rabobank team had a hell of a time with the infernal speed and ever changing situation out on the road. The wily David Rebellin, who started his pro career when Gesink was just six years old, took note of the Rabobank struggles. The day after Ventoux he bided his time. A couple of days later he launched a blistering attack on the final mountain descent of the day and distanced himself from Gesink and the shattered Rabobank team to claim the Yellow jersey for good. Such sights are new and very welcome. If indeed the riders are ‘clean', then they should clearly see that it is of a huge advantage to them. The racing has become incredibly exciting and the public has responded enthusiastically. These are the ingredients that attract the sponsors. And the sponsors pay the bills! A whole crop of young new riders are assuming their place at the head of the peloton with riders like Mark Cavendish (22), Thomas Dekker (23), Robert Gesink (22) and Martyn Maaskant (25) leading the way. Meanwhile the ‘old hands' like Cancellara, Boonen, Rebellin and Valverde are delivering spectacular performances and acting as true role models to the next generation. The Omloop Het Volk is known to open the spring campaign and L-B-L closes the early season. Fabulous attacking racing, huge crowds and no politics or scandals, lead us to hope that the Grand Tours and all of the other great races yet to come this year will become the Grand Cru of an already vintage season.